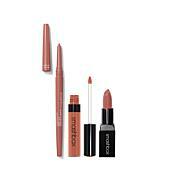 A luxurious lipstick that conditions your lips with its soft, smooth and creamy formula while covering them in extremely wearable, gorgeous shades, perfectly paired with our ultra-hydrating, color-coordinated lip gloss. Apply lipstick to top and bottom lips. 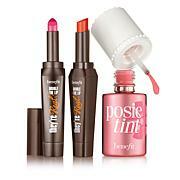 Top with gloss for the appearance of fuller-looking lips that shine! 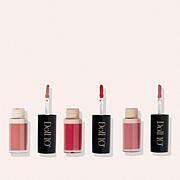 Ingredients: Lip Gloss: Hydrogenated Polyisobutene, Tridecyl Trimellitate, Polyglyceryl-2 Diisostearate, Octyldodecyl Stearoyl Stearate, VP/Hexadecene Copolymer, Octyldodecanol, Silica, Trimethylolpropane Triisostearate, Mangifera Indica Seed Butter (Mangifera Indica (Mango) Seed Butter), Theobroma Cacao Seed Butter (Theobroma Cacao (Cocoa) Seed Butter), Hyaluronic Acid, Hydrolyzed Collagen, Tocopheryl Acetate, Palmitoyl Tripeptide-1, Flavor, Ethylhexyl Palmitate, Sorbitan Isostearate, Diisostearyl Malate, Polyglyceryl-2 Triisostearate, Sodium Saccharin, Tribehenin, Calcium Titanium Borosilicate, Tin Oxide, Mica. May Contain(+/-): CI 77891 (Titanium Dioxide), CI 77491, 77492, CI 77499 (Iron Oxides), CI 15850 (Red 7), CI 19140 (Yellow 5 Lake), CI 42090 (Blue 1 Lake). Lipstick: Diisostearyl Malate, Tridecyl Trimellitate, Octyldodecyl Stearoyl Stearate, Polyethylene, Octyldodecanol, Hydrogenated Coco-Glycerides, Cera Microcristallina (Microcrystalline Wax, Cire Microcristalline), Calcium Aluminum Borosilicate, Calcium Titanium Borosilicate, Talc, Flavor, Prunus Amygdalus Dulcis (Sweet Almond) Oil, Simmondsia Chinensis (Jojoba) Seed Oil, Mangifera Indica Seed Butter (Mangifera Indica (Mango) Seed Butter), Theobroma Cacao Seed Butter (Theobroma Cacao (Cocoa) Seed Butter), Cetyl Alcohol, Tocopherol, Lecithin, Glyceryl Stearate, Ascorbyl Palmitate, Behenic Acid, Isostearyl Isostearate, Potassium Cetyl Phosphate, Cetyl Behenate, Sodium Saccharin, Ethylhexyl Palmitate, Glyceryl Oleate, Citric Acid, Tribehenin, Hydrolyzed Collagen, Hyaluronic Acid, Sorbitan Isostearate, Palmitoyl Tripeptide-1, Tin Oxide. May Contain(+/-): CI 77891 (Titanium Dioxide), 77491, 77492, CI 77499 (Iron Oxides), CI 15850 (Red 7 Lake), CI 42090 (Blue 1 Lake). 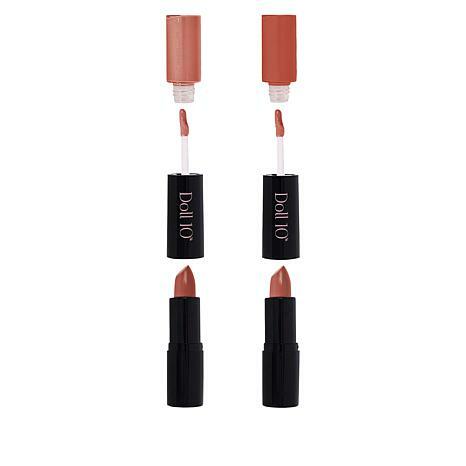 Ingredients: Lip Gloss: Hydrogenated Polyisobutene, Tridecyl Trimellitate, Polyglyceryl-2 Diisostearate, Octyldodecyl Stearoyl Stearate, VP/Hexadecene Copolymer, Octyldodecanol, Silica, Trimethylolpropane Triisostearate, Mangifera Indica Seed Butter (Mangifera Indica (Mango) Seed Butter), Theobroma Cacao Seed Butter (Theobroma Cacao (Cocoa) Seed Butter), Hyaluronic Acid, Hydrolyzed Collagen, Tocopheryl Acetate, Palmitoyl Tripeptide-1, Flavor, Ethylhexyl Palmitate, Sorbitan Isostearate, Diisostearyl Malate, Polyglyceryl-2 Triisostearate, Sodium Saccharin, Tribehenin, Calcium Titanium Borosilicate, Tin Oxide, Mica. May Contain(+/-): CI 77891 (Titanium Dioxide), CI 77491, 77492, CI 77499 (Iron Oxides), CI 15850 (Red 7), CI 19140 (Yellow 5 Lake), CI 42090 (Blue 1 Lake). Lipstick: Diisostearyl Malate, Tridecyl Trimellitate, Octyldodecyl Stearoyl Stearate, Polyethylene, Octyldodecanol, Hydrogenated Coco-Glycerides, CeraMicrocristallina (Microcrystalline Wax, Cire Microcristalline), Calcium Aluminum Borosilicate, Calcium Titanium Borosilicate, Talc, Flavor, Prunus Amygdalus Dulcis (Sweet Almond) Oil, Simmondsia Chinensis (Jojoba) Seed Oil, Mangifera Indica Seed Butter (Mangifera Indica (Mango) Seed Butter), Theobroma Cacao Seed Butter (Theobroma Cacao (Cocoa) Seed Butter), Cetyl Alcohol, Tocopherol, Lecithin, Glyceryl Stearate, Ascorbyl Palmitate, Behenic Acid, Isostearyl Isostearate, Potassium Cetyl Phosphate, Cetyl Behenate, Sodium Saccharin, Ethylhexyl Palmitate, Glyceryl Oleate, Citric Acid, Tribehenin, Hydrolyzed Collagen, Hyaluronic Acid, Sorbitan Isostearate, Palmitoyl Tripeptide-1, Tin Oxide. May Contain(+/-): CI 77891 (Titanium Dioxide), 77491, 77492, CI 77499 (Iron Oxides), CI 15850 (Red 7 Lake), CI 42090 (Blue 1 Lake).